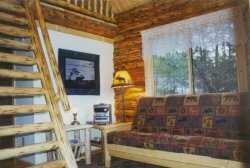 Our new log cabins (The Eagle's Nest, The Kootenai Cabin, and The Montana Cabin) will provide a wonderful vacation experience for you and your entire Family. Your new log cabins are located in the far northwest corner of Montana near the towns of Eureka and Rexord. It is only six miles from the border of British Columbia and due west of Glacier/Waterton International Peace Park. 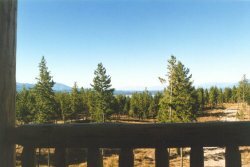 Two of the log cabins are situated on 20+ scenic acres (very private) and have breathtaking views overlooking 95 mile long Lake Koocanusa and the Canadian Rockies. 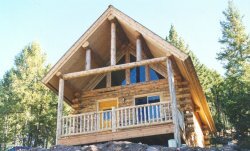 The third log cabin has end of the road privacy and backs up to thousands of acres of National Forest. This cabin is completely powered by solar, wind, and propane and is located near a small Amish community. From your large decks you'll enjoy the majestic mountain, lake, or valley views! 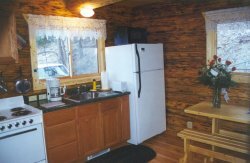 Your log cabins come fully furnished with all linens, utensils, and cookware. Everything that you'll need for a very enjoyable and relaxing vacation. You'll just need to bring yourself and any food/drink that you may require during your vacation.